May be all have forgotten this incident, but the family remembers this , it was exactly a couple of years ago on this very day when we saw a horrific accident at Udyambag where Darshini Sanjay Chougule (20) a computer science student was hit by lorry at Majagaon Cross, while crossing the road on two-wheeler. After speedy hit, Darshini fell down under the wheels of lorry, in which her face was brutally crushed claiming her life on spot and her friend was injured. But has anything changed even after TWO years is the BIG Question. There was a raasta roko done by students and the DC and the RTO had promised that heavy vehicles will not be permitted in the city during specific hours, but all in vain. Do they infact even remember that such a thing was discussed is the Question now. The road is now widened for sure but is still incomplete in some places and has already caved in some places. Even not a single traffic police deploys to manage the traffic. As the road is being widened to 120ft from existing 60ft, both sides trees on the road have been cut. This has made the traffic even messy. 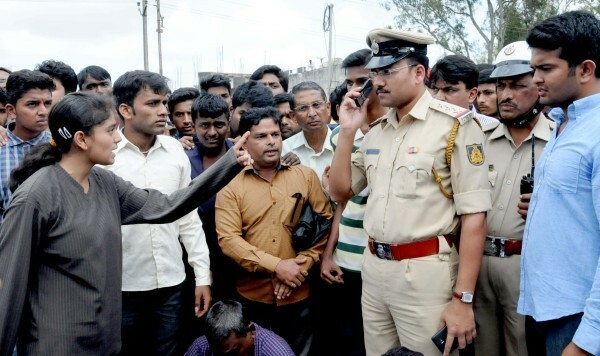 After the accident, people are angered against the negligence of police and other concerned authorities for neglecting the traffic management and not making helmet mandatory. The police do check for helmets without fail, but have other traffic measures been in place which were promised or have to be done after the widening is over. Where is the ban on heavy vehicles which was spoken about then or is it that we just forget things so easily that we have to wait for another Darshini to loose her life and then we awaken ourselves again. Have any measures been implemented so that such horrific accidents don’t occur again? Yes we do have those Speed Breakers, which are more of vehicle breakers than speed breakers. My Daughter lost her laughter. Never was silent always chatter chatter. She had a dream in her beautiful eyes. But could not be fulfilled even when I am alive. On her face she had a smile. Which could be seen from a mile. Never ever had a expression of doubt. Always confident of everything all about. For me I wanted to donate her eyes. Someone could see the world but I could see her eyes. Never ever in my wildest dreams I dreamt of this fate. I could do nothing because I reached there too late. My Daughter will definitely come in my next life I know. Then I will beg to the Almighty to first let me go. We lost Darshini very soon and we dont want another family to face a similar occurrence. We just pray to the Almighty to give soul rests in peace. I just visited to Belgaum city, but sorry to say that nothing has changed. Traffic is as it is worse than last 2 years, no restrictions for heavy vehicles, absence of traffic police is as usual, conditions of roads are remaining same. No use of widening roads and cut of trees. Whatever has happened to Dharshini is truly tragic.But thing is that the general public are to blamed. Everyone is in a hurry. Nobody will follow traffic rules. Two wheelers, four wheelers and cyclists also does ride n drive in opposite direction of road. Even though one has to always keep left while riding/driving,but nobody is bothered follow the rules.Also their should be strict enforcement of traffic rules. Uday , Banning Heavy vehicles is not a solution. These trucks play a imp role in logistics for the nation. Why dont the authorities stop the wrong parking of two wheelers / four wheelers / hawkers and the most troublesome The Auto rickshaw’s who block the road by parking near major junctions! Most of the Bus stops are been takenover by these rickshaws forcing the busses to stop in the middle of the roadand thus blocking the traffic. I know that AAB has failed in vain to Bell the auto walas and everyone in the city knows that none can stop them from creating a havoc in the city. Horrible position in Belgaum regarding traffic control they are not present only. Heavy vehicles creating lot of problems. Police should be shaken so they may do their duty.